Alaska in not only famous for its bears and moose, it has also vast caribou herds, Dall sheep and mountain goats. Large number of black and brown bears are scattered in some areas of Alaska. Black tailed deer, wolves and waterfowls are also abundant in the Alaskan wilderness. The Alaska hunting grounds is one of the top hunting grounds in the United States. Alaska is truly a hunter’s haven. The Alaskan season usually starts on August and ends on October. However, hunting season on some areas in Alaska continues until the winter months. The wilderness in Alaska needs a lot of physical and mental preparation. Alaska hunting also needs logistical planning. If you want to go hunting on Alaska you must consider a lot of factors like the weather. You must be capable of remaining on the wilderness for a long time under extreme conditions. Never underestimate wilderness in Alaska. Inadequate planning and preparation can lead to a fatal hunt. Alaska hunting and fishing trips can be rewarding, although not all hunters share the same fate. Alaskan opportunities vary, depending on the region you are in. The general Alaska hunting season is usually open to an unlimited number of hunters. Hunters are needed to have a hunting license in Alaska. Some areas in Alaska are located along its road system. On the other hand, some hunters need to be transported by aircraft or boat to some remote Alaska hunting areas. A large part of Alaska is public lands open to fishing and hunting. But, a lot of great Alaska hunting grounds are privately owned. Hunters need permission before they go on hunts in these privately owned grounds. Most of these privately owned grounds are owned by regional or village native corporations in Alaska. However, not all the public lands in Alaska are open for hunting, and most of the national parks in Alaska are closed. 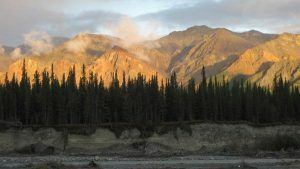 But there are also some lands that are governed by the National Park Service, are open for affordable Alaska hunts and some lands under the Alaska National Parks are open only for qualified rural residents of Alaska. Most of the lands under National Wildlife Refuge, Bureau of Land Management and National Forest are open for hunting. For areas that are available for hunting and to learn the Federal hunting regulations, go and inquire at the Alaska Public Lands Information Centers. Non-residents must obtain hunting licenses and tags, which are also available from sporting goods retailers and stores.